If you have only one day in Jaipur Then go for Jaipur one day city tour to explore the beauty of Jaipur and Amber fort. Jaipur is one of the most beautiful & heritage cities of Rajasthan. Its beauty is incomparable. This Jaipur One Day City Tour takes you to the best historical places of the Jaipur including a shopping extravaganza at the end of the day. Arrival at Jaipur For the beautiful trip in the city of Jaipur, you will be picked up in an air conditioned cab for a day trip from Delhi & Other City. It will take 5 – 6 hours to reach Jaipur, so we will start early. Morning Sightseeing On reaching Jaipur, we will first take you to Amber Fort – the most magnificent Fort which was started by Raja Mann Singh and later on completed by Sawai Jai Singh in the 18th century. 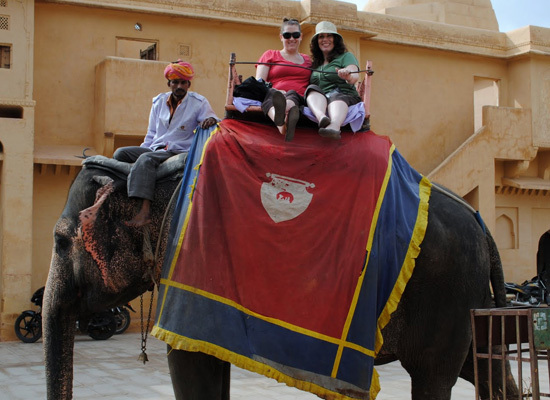 Take a elephant back ride up to the Amber Fort. Here enjoy the paintings of peacock and Kings n Queens on the wall of the Fort. As you ride towards the fort, so not forget to enjoy the panoramic view uphill. A buffet lunch shall be offered soon after the go – around of the fort. Afternoon Sightseeing Soon after the lunch, move on to see the largest Jantar Mantar observatory of Rajasthan – a good architectural work by Sawai Jai Singh! After seeing the observatory, we will take you to the magnificent City Palace. Evening Sightseeing and Departure back to Delhi The evening shall be accomplished by visit to Babu Market which is filled with Rajasthani culture dress, artificial jewellery, artifacts and souvenirs’. From here we shall take you back to New Delhi – the last place of your tour!